Mouse anti Human vinculin antibody, clone V284 (MCA465GA) used to illustrate vinculin expression on murine retinal cell line 661W by immunofluorescence. Morphology of 661 W on the PET membrane for control and after 120 min of applied EF. Cells were labeled for (a) nucleus,(b) vinculin, (c) filamentous actin cytoskeleton, and (d) merged image. The direction of the arrow shows the direction of the cathode and anode positions. Scale bar 50μm. 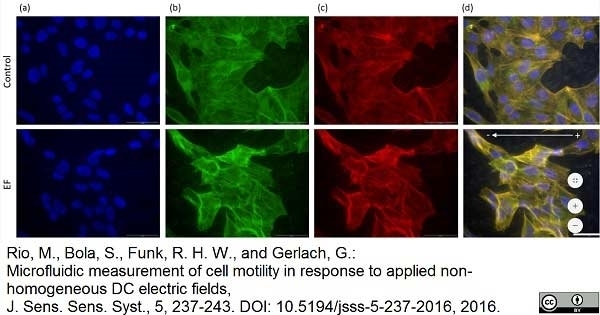 From: Rio, M., Bola, S., Funk, R. H. W., and Gerlach, G.
Microfluidic measurement of cell motility in response to applied non-homogeneous DC electric fields. J. Sens Sens Syst, 5, 237-43. Mouse anti Human vinculin antibody, clone V284 recognizes human vinculin, also known as metavinculin. Vinculin is a highly conserved, cytoskeletal protein associated with cell-cell and cell-matrix adhesion. Vinculin is an actin filament (F-actin)-binding protein involved in anchoring F-actin to the membrane. 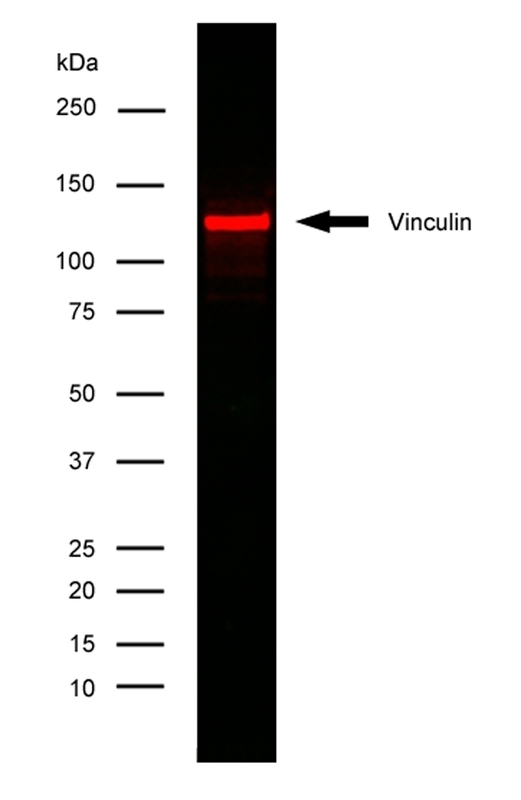 Mouse anti Human vinculin antibody, clone V284 detects vinculin as a ~130 kDa band in homogenates of platelets and other cells. It reacts with leucocytes, muscle cells, epithelial cells and fibroblasts. Asijee, G.M. et al. (1990) Vinculin is a permanent component of the membrane skeleton and is incorporated into the (re)organising cytoskeleton upon platelet activation. Eur J Biochem. 189 (1): 131-6. Brown, H. et al. (2001) Blood-brain barrier function in cerebral malaria in Malawian children. Am J Trop Med Hyg. 64 (3-4): 207-13. Porter, R.M. et al. (1993) Monoclonal antibodies to cytoskeletal proteins: an immunohistochemical investigation of human colon cancer. J Pathol. 170 (4): 435-40. Zheng, P.P. et al. (2007) Hela l-CaD is implicated in the migration of endothelial cells/endothelial progenitor cells in human neoplasms. Cell Adh Migr. 1: 84-91. Frangogiannis, N.G. et al. (2002) Active interstitial remodeling: an important process in the hibernating human myocardium. J Am Coll Cardiol. 39: 1468-74. Andrews, K.D. et al. (2008) Vascular prostheses: performance related to cell-shear responses. J Surg Res. 149: 39-46. Dlugosz, J.A. et al. (2000) Stretch-induced mesangial cell ERK1/ERK2 activation is enhanced in high glucose by decreased dephosphorylation. Am J Physiol Renal Physiol. 279: F688-97. Frye, M. et al. (2003) Evidence that Myc activation depletes the epidermal stem cell compartment by modulating adhesive interactions with the local microenvironment. Gray, M.J. et al. (2008) Therapeutic targeting of Id2 reduces growth of human colorectal carcinoma in the murine liver. Jester, J.V. et al. (1999) Transforming growth factor(beta)-mediated corneal myofibroblast differentiation requires actin and fibronectin assembly. Invest Ophthalmol Vis Sci. 40: 1959-67. Jester, J.V. et al. (2003) Myofibroblast differentiation of normal human keratocytes and hTERT, extended-life human corneal fibroblasts. Invest Ophthalmol Vis Sci. 44: 1850-8. DeFife, K.M. et al. (1999) Cytoskeletal and adhesive structural polarizations accompany IL-13-induced human macrophage fusion. J Histochem Cytochem. 47: 65-74. Hua, H. et al. (2003) Endothelin-1 activates mesangial cell ERK1/2 via EGF-receptor transactivation and caveolin-1 interaction. Am J Physiol Renal Physiol. 284: F303-12. Zheng, P.P. et al. (2007) Hela /-CaD undergoes a DNA replication-associated switch in localization from the cytoplasm to the nuclei of endothelial cells/endothelial progenitor cells in human tumor vasculature. Cancer Biol Ther. 6: 886-90. Monsees, T.K. et al. (2005) Effects of different titanium alloys and nanosize surface patterning on adhesion, differentiation, and orientation of osteoblast-like cells. Cells Tissues Organs. 180: 81-95. Rebhun, R.B. et al. (2006) Targeting receptor tyrosine kinase on lymphatic endothelial cells for the therapy of colon cancer lymph node metastasis. Sluka, P. et al. (2006) FSH regulates the formation of adherens junctions and ectoplasmic specialisations between rat Sertoli cells in vitro and in vivo. Ananthaseshan, S. et al. (2017) Locally Transplanted CD34+ Bone Marrow-Derived Cells Contribute to Vascular Healing After Vascular Injury. Transplant Proc. 49 (6): 1467-76. Journal of Sensors and Sensor Systems. 5 (2): 237-43. Kubler, M.D. & Watt, F.M. (1993) Changes in the distribution of actin-associated proteins during epidermal wound healing. J Invest Dermatol. 100 (6): 785-9.